I never cease to be inspired by the people, places, and things I see on the way to dropping Liron off at school, driving her to her friend’s house – and while I’m driving, biking, walking, or taking the bus to work. Rarely goes a morning or afternoon where I don’t fumble to snag a really quick photo on my iPhone. I really need a new strategy so I capture EVERYTHING! In the meantime, enjoy a funny photo (funny to me at least) I caught this morning. Apologies to any reader who has this bumper sticker or a similar one. Dang, I was going to tailgate you for the next five miles and then give you a nice fender bender but then I saw you mentioned you had a precious little monster in the back buckled lovingly in his/her $300 Britax “Precious Gem of an Angel” car seat and I changed my mind. Oops, I mean, I was going to be a nice person but then I saw your sticker and it made me giggle and feel slightly angry. Now I will make fun of you and then crash you. Don’t antagonize me mom or dad. Yeah, I have the most precious kid in the world. Doesn’t mean I have to advertise it and then ask you spare our lives. 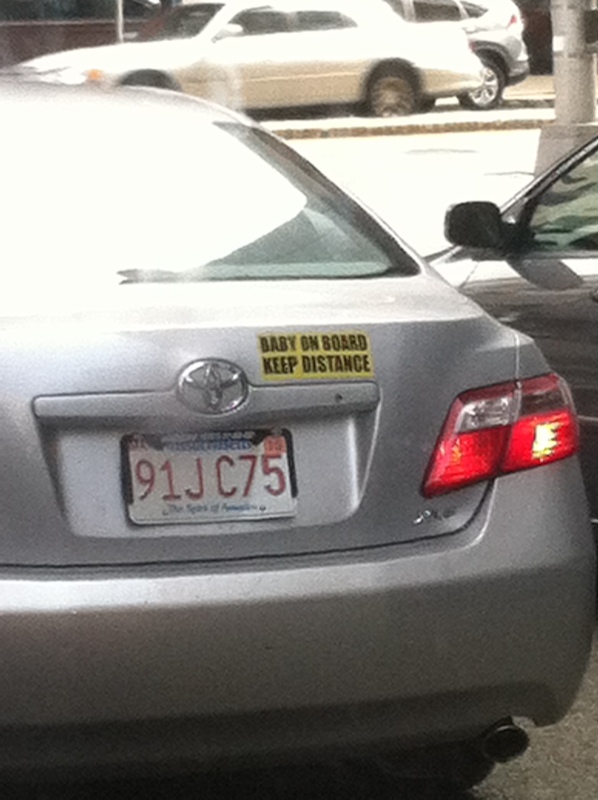 I’ve seen those around………..like I was going to hit your car on PURPOSE!!!!! !